After complaining about the ant invasion in our strawberry patch, I’m happy to be eating my words. I reached in to the dense green foliage of the strawberry patch and came up with the perfect berry: ripe, bright red and ready to eat. The ants moved on, preferring the cast-offs from the fruit tree. The rats and squirrels eat half, then dump the rest for the ants and the fruit flies. No matter. I gathered the berries the snails missed, and put them to good use that night. The day before, I read Strawberry glut daiquiri at Promenade Plantings. I’m not much of a drinker, unless you count water and tea, but this sounded really good. We actually had white rum and lime in the house, so it all seemed serendipitous. If you have your own glut of strawberries and you like the occasional fruity drink with a kick, this drink is delicious. What else can you do with all those strawberries? This entry was posted in Gardening and tagged Garden Sunshine, growing strawberries, organic gardening, Promenade Plantings, strawberry daiquiri, what to do with a glut of strawberries, Words and Herbs. Bookmark the permalink. They look so beautiful and so perfect. I have added strawberry’s to my diet to improve my nutrition, on missed the memo that you could add rum. LOL! They’re not nearly as good for you soaked in rum, but for the occasional treat, delicious. Berries are an amazing nutritional deal, filled with vitamins, fiber, and delicious goodness. Enjoy. You’re welcome. I always enjoy your blog. 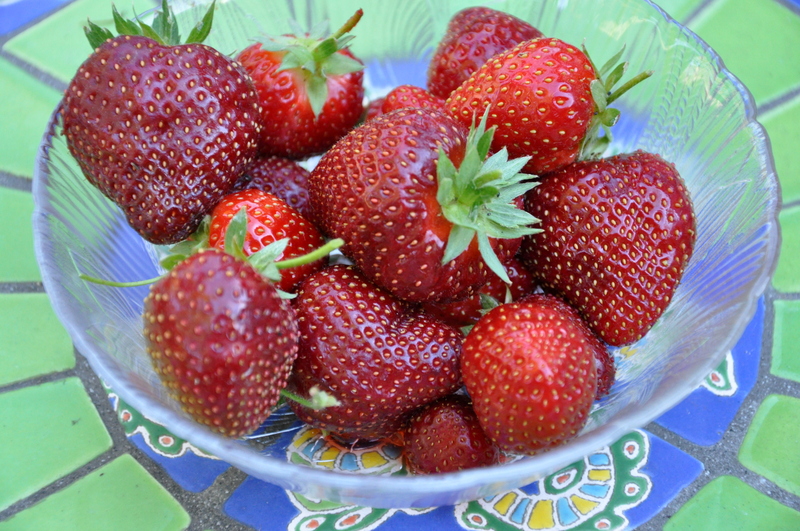 You got to eat your own home grown strawberries – I bet they tasted so sweet! and thanks for the shout out 🙂 Hope you have a great weekend! Hurray for strawberries. I’m happy to hear yours are doing well. It sounds like an abundant crop. I’m so glad you ordered the stencil you were pining for. Hurray for you. I can’t wait to see your next project. Oh boy, fresh picked strawberries are so much better than store bought! I picked yet another huge bowl of them today, planning on eating half of them tonight! I love love love my new stencil, and now I want to use it in our bathroom too! Oh the possibilities! So glad you get to eat your words!! Nothing like a fresh, sweet strawberry, fresh from the garden! Those berries look HUGE and delicious. There is a good crop here this year, they actually taste pretty close to strawberry-ish and are a good size. But 6 pints cost 20 dollars. Seems like a lot to me- growing your own is a much better option. Love that drink option. I could get into that!! I busted out laughing at your thigh comment. You are so funny. That crumble sounds delicious, regardless of one’s thighs, but I can relate. It is amazing how affordable produce can be at the right time of year, but we don’t pay our farm works a living wage, so I know that sadly factors in. People have no room to complain…but they do! Ha. Yummo! I can almost taste them. I must get out there and sort out my plants so I can have some too in a few months! Aren’t they delicious? I never get tired of strawberries. Do you start yours from seed, Sarah? I’ve only ever grown them from small plants.